Web hosting is the prime source of Internet hosting service which actually allows individuals and organizations to make their website accessible via the World Wide Web. The web hosting companies that provide space on a server on lease to the clients, as well as provide Internet connectivity, typically in a data centre. To access the data centres from remote locations, CDN plays a vital role in web hosting. There are plenty of options out there in the market for web hosting providers from which you can choose any of the hosting company according to your business niche or website requirements. Web hosting provider plays an important for online business. You just can’t say that you have a well-designed website as it does not mean that your website will be ranked in Google. The above mentioned are the few important parameters that you must consider while selecting a web hosting company for your business. This article will give you overall “MilesWeb Review”. As the leading web hosting company provides so many web hosting features and services at an affordable price point. MilesWeb is one of the top most web hosting providers across a globe. The company was founded in 2012 with the motto to help small and medium size businesses to easily get online at an affordable cost. The web hosting company serves the best in class features and services such as shared hosting, VPS Hosting, reseller hosting, cloud hosting, WordPress hosting, etc. to their customers. MilesWeb company consists of experienced Linux and Windows system administrators who are committed to offer world class service 24×7. The renowned web hosting company got various and precious awards such as Readers choice award 2016 by Host Review, Excellent service award by HostAdvice, Top 10 web host awards dedicated server by HostReview. The leading web hosting company is verified by Inc.com for their terrific performance in the web hosting industry. MilesWeb provides the best web hosting solutions that are simple, powerful and reliable for the users. They offer various server locations and you can choose any of the server locations from India, UK and the US. The web hosting company allows you to choose a brand new domain and also helps you to transfer your existing domain without any charge. For better website performance and fast page loads, MilesWeb stores all your website data on SSD drive. Just by installing this tool, select the template, add your content / images and publish your website. No need of any coding skills or technical background. You can easily install the tool by your own. You can protect your website and visitors’ sensitive data with the SSL certificate. In addition, you can boost your website ranking with SSL. The SSL certificate is basically used to show your customers that you’re trusted. You can access all your emails with Unlimited POP3 / IMAP email accounts via the webmail support. Manage your website, emails, databases, domains, sub-domains and much more with cPanel control panel. Through 1-click installer, you can easily install various applications such as Joomla, WordPress, Shopping cart, etc. The website is auto scanned on a daily basis and the company claims that if they find any threats, they fix it for you with mentioned tool. Your account gets instantly setup after successfully completing with the sign up and payment process. The leading web hosting company states that they provide the latest, most stable and the most compatible versions of PHP & MySQL on all their servers. At the time of sign-up you can choose preferred data center location from India, UK and US. At any moment if you’re not satisfied with the existing hosting company? Then you can switch to MilesWeb. They migrate all your data onto their server without any additional charges. Note: If you want to make thousands of money. Then join a highly rewarding affiliate program of MilesWeb and earn upto 50% commission per sale. Once you have finished with the sign up process, you get Rs.1000 as the bonus amount without any registration fees. And also if you face any queries at the time of registration then no need to worry because the company claims that their affiliate person will assist you throughout the process. 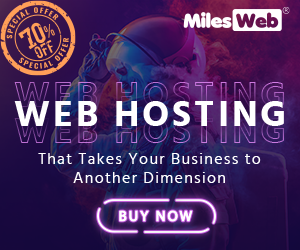 Now the final verdict is if you are looking for any cheap web hosting provider then select MilesWeb and build your online presence. ← Why do You Need to Hire Professional SMO Agency?